Every year, the winners of the Nobel Prizes are announced to great fanfare. And none receives more scrutiny than the Nobel Peace Prize. With good reason. The other Nobel Prizes are given to people who have already changed our world – for their remarkable accomplishments. But, in the case of the Nobel Peace Prize, the hope of the Nobel Committee is to change the world through its very conferral. It, therefore, rewards aspiration more than achievement. So, has the Nobel Peace Prize changed the world? Expecting the prize to bring world peace would be an unfair standard to apply. However, my research shows that the winners and their causes have rarely profited from the award. Even worse, the prize has at times made it harder for them to make the leap from aspiration to achievement. The committee initially remained true to Nobel’s charge. Between 1901 and 1945, over three-quarters of the prizes (33 of 43) went to those who promoted interstate peace and disarmament. Since the Second World War, however, less than one-quarter of the prizes have gone to promoting interstate peace and disarmament. Just seven of the 37 winners since 1989 fall into this category. Another 11 awards have sought to encourage ongoing peace processes. But many of these processes had borne little fruit at the time or still had a long road ahead. 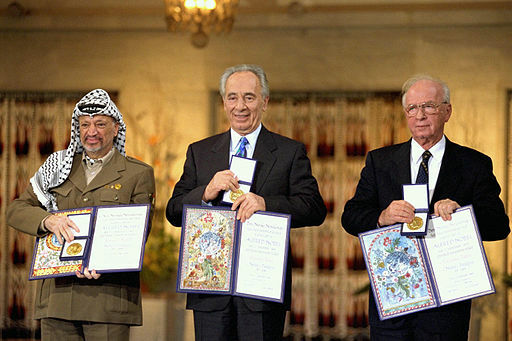 Consider that three of the most prominent winners in this category were then Palestine Liberation Organization Chairman Yasser Arafat, Israeli Foreign Minister Shimon Peres and Israeli Prime Minister Yitzhak Rabin. Nonetheless, the Israeli-Palestinian peace process is today in a coma. Perhaps for this reason, in the last decade, the committee has given just two awards to encourage peace processes. In 2008 Martti Ahtisaari, former president of Finland, was awarded the Nobel Peace Prize for his various achievements in Namibia, Kosovo and Aceh. In 2016, Colombia’s President Juan Manuel Santos was honored with the Nobel in the hope that the prize would help push through his peace deal with the Revolutionary Armed Forces of Colombia (FARC) rebels, even though a popular referendum had just rejected it, and thereby end his country’s half-century-long civil war. The striking change since the 1970s, and especially since the end of the Cold War, has been the Nobel Peace Prize’s growing focus on promoting domestic political change. Between 1946 and 1970, the prize was awarded just twice to dissidents and activists like the South African leader Albert Luthuli, who led a nonviolent struggle against apartheid in the 1960s, and the American civil rights leader Martin Luther King Jr.. Between 1971 and 1988, such figures received the prize five times. Between 1989 and 2016, more than 40 percent of all winners fell into this category. The rate has been even higher in the last decade: 57 percent of Nobel Peace Prize laureates since 2007 have been activists and advocates for equality, liberty and human development like educating women and stopping child labor. These are admirable values. But their connection to interstate, and intrastate, conflict is indirect at best and tenuous at worst. Does it bring global attention to issues? The Nobel Peace Prize’s defenders insist that the prize works in subtle but perceptible ways to advance the winners’ causes. They say it attracts media attention, bolsters the winners and their supporters, and even focuses international pressure. But there’s little evidence that the Nobel Peace Prize brings sustained global attention. First of all, in many instances it is hard to tell whether the prize has made any difference, because the media glare was already intense. For example, in 2005, when the committee honored the International Atomic Energy Agency and its director general, Mohammed El Baradei, nuclear proliferation was already of great concern. In other cases – such as South Africa’s transition from apartheid, the Israeli-Palestinian conflict or the troubles in Northern Ireland – the prize made little noticeable difference to international media coverage. It is true that in those few cases where coverage was not already strong, there have been occasional successes. For instance, I found that the committee’s decision to hand the award to Aung San Suu Kyi in 1991 did draw attention to the plight of Myanmar. But, in general, my research found little evidence that winning the Nobel Peace Prize boosts international media coverage of the winner’s cause beyond the short run. Of greater concern is that, when the Nobel Peace Prize goes to promote political and social change – as it has so often in recent decades – it can have very real and detrimental effects on the movements and causes it celebrates. Powerful authoritarian regimes will not liberalize just because the Nobel Committee has chosen to honor a dissident. This is not because regimes dismiss it as a silly award given out by international do-gooders. In fact, they take it very seriously. Fearing that domestic activists would take heart, they have ramped up repression, shrunk the space for political opposition and cracked down harder than ever. This is what happened in Tibet and Myanmar after the Dalai Lama and after Aung San Suu Kyi received the Nobel Peace Prize in 1989 and 1991, respectively. Similarly, the Iranian lawyer and human rights activist Shirin Ebadi has been forced to lived in exile in Britain since 2009. In China, the peace award did not make the release of the dissident Liu Xiaobo from prison more likely. The same is true when it comes to social change. Patriarchal societies, with their deeply entrenched gender roles, will not change just because some people in the West think they should and to that end name a women’s rights activist a Nobel laureate. The Nobel Committee’s intentions are honorable, but the results, I argue, can be tragic. The award raises the spirits of reformers, but it also mobilizes forces that are far greater in opposition. Every October, many the world over hail the Nobel Committee for its brave and inspired choice. But it is the truly brave activists on the ground who are left to bear the consequences when anxious leaders bring the state’s terrible power down on them. And what happens when the Nobel Peace Prize actually helps to promote political change? As state counsellor (prime minister) of Myanmar, Aung San Suu Kyi has presided over the bloody persecution of the Rohingya and a swiftly mounting international refugee crisis. The admired dissident has, in power, turned out not to be so great a promoter of peace and tolerance. The Nobel Peace Prize Committee’s choices have been noble – but, as my research suggests, also sometimes naïve.